At our house, we empty the freezer once a year – right around the Christmas holidays -- partly because, as the months wear on, it becomes increasingly difficult to pick through the ice formations but mostly because we have to make room for turkeys. Now, when I say freezer, I’m not referring to one of those puny, attached-to-your-fridge jobs. Our freezer is a monster – lose-your-best-friend-Larry-if-you’re-not-careful freezers. I estimate it is around 10,000 cubic feet (or something close to it). Our freezer, despite its size, does little else but store turkeys – free-range, caged-up, young, old, stuffed, grease-injected... you name it – we’ve got it. Why so many? It’s simple. My family is cursed. We receive turkeys as gifts. We win turkeys at the gas station. Turkeys follow us home. 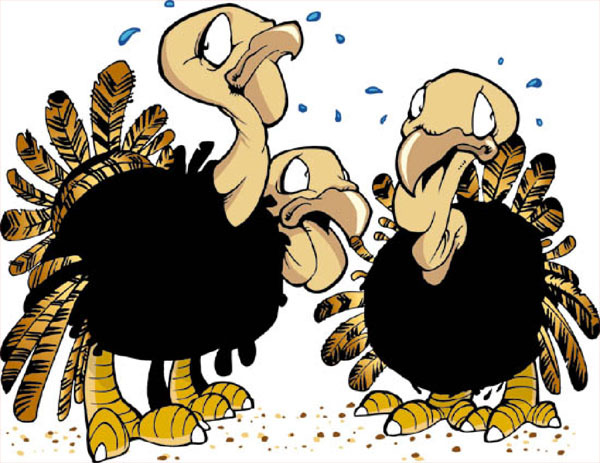 We answer the door to find please-take-care-of-this-turkey turkeys. So, every year, around this time, the turkey storage unit (freezer) needs to be stripped, chipped and hosed down, to make room for more birds. This year, we decided to make good use of each and every one of the turkeys that have been taking up space in the bowels of our freezer and create wonderful Christmas gifts that the entire family could enjoy. Here for you now, are my personal favourites. Fee free to steal my ideas. Your family will thank you. Trust me, I’m an artist. Without further ado… (Martha, eat your heart out). Turkey stuffing earmuffs – to keep you warm during those chilly winter outings. Turkey fat bath oil – guaranteed to make even the roughest skin smooth and supple. Turkey liver lip balm – because winter winds can wreak havoc on the lips. Turkey centerpiece – just add evergreen sprigs and you’re done. 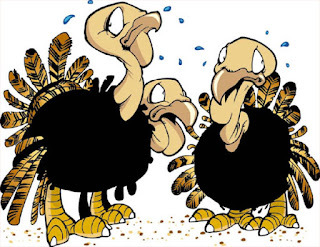 Turkey feather duster – better than a Swiffer®. Turkey wishbone sculptures – no explanation necessary. Turkey feet candle holders – so chic. After we were finished in the craft room, we collectively made the decision to scrap the Christmas turkey and cook a Tofurky vegetarian feast instead. The box claims that each feast is 100% vegan, cooks in about an hour, serves six and tastes fabulous! 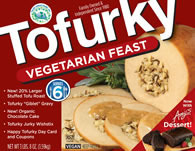 Tofurky dinner is on Boxing Day.